Riesling’s moniker of being a sweet white wine is being shed. It’s the food friendly flavors, coupled with the transparent and diverse nature that has positioned Riesling as the darling of wine in the eyes of sommeliers, winemakers and wine enthusiasts. This has helped to add to the cadre of Riesling enthusiasts who spurn the dated notion that all Rieslings are simple and sweet, perfect for granny’s favorite pre-supper quaffer. Chameleon-like, this versatile food-friendly wine has further enamored the varietal with diners. Riesling is as comfortable while pairing with creamy sauced dishes as it is while serving as a companion for the complex spicy and sweet flavors of Asian dishes. Since Washington State’s wine industry’s inception, Riesling has been a staple. Its first planting was in 1965. Riesling leads all the other white varietals harvested in the state, growing from a scant 10,000 tons harvested in 1999, to 50,500 tons harvested in 2014. Riesling thrives in the Columbia Valley. With the dry, desert-like conditions, warm days, very cool nights and higher temperatures than the Riesling growing regions of Europe, Washington Riesling expresses itself with full-flavor and elegance. The endorsements of Riesling from noted wine notables, including Jancis Robinson, further punctuate the high quality and good value of Washington selections. Ste. 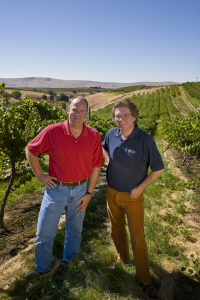 Michelle head winemaker Bob Bertheau (left) with Dr. Ernst Loosen (right). All this popularity has been bolstered by the Eroica project, championed by Chateau Ste. Michelle of Washington and German winemaker Ernst Loosen, who is the owner of Dr. Loosen Estate which has a 200-year tradition of producing Riesling in Germany’s Mosel region. Chateau Ste. Michelle has been making Riesling in Washington for more than 45 years and is now the leading producer of Riesling in North America. Chateau Ste. Michelle and Dr. Loosen Estate will host the fifth Riesling Rendezvous July 17-19 in Woodinville & Seattle. This will be the largest event dedicated to the varietal in the United States. The Grand Tasting will feature 70 wineries from Alsace, Australia, Austria, Canada, Germany, New Zealand, and the United States. 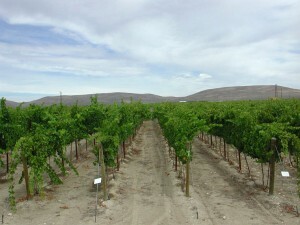 Depending upon the vineyard site, flavors range from white peach and mandarin fruit with crisp acidity from cooler sites, to more tropical and unctuous flavors coming from warmer sites including Cold Creek Vineyard and the Wahluke Slope. The diversity of sites also allows for dry Riesling, Ice Wine and Botrytis-affected late harvest wines. Chateau Ste. Michelle makes up to ten different Rieslings, depending upon growing conditions. Columbia Valley Riesling, Dry Riesling, Harvest Select Sweet Riesling, Cold Creek Vineyard Riesling, Waussie Riesling (club & retail wine), Ethos Late Harvest Riesling, Eroica Riesling, Eroica Gold Riesling, Eroica Ice Wine (when conditions allow) & Single Berry Select. Stop by the Chateau Ste. Michelle display at the Seattle Food and Wine Experience, Sunday, Feb. 21st, to explore the wonderful world of Riesling and take the Riesling Challenge.